The media presents this as a time of great joyfulness for all. And yet many of us, perhaps even most of us, go into the holiday season with a sense of dread, anticipating loneliness, disappointment, and reminders of past hurts. In the past, the holidays have been difficult for me. One year, I decided to ignore them altogether, did not engage in any of the festivities, and rejected overtures from family members and friends. I spent the time alone. I thought it would feel good and right, but it didn’t. It felt awful, like a terrible waste. Since making that discovery, I’ve decided to make good use of my WRAP to make my holidays the very best that they can be. I have my WRAP online so it’s easy for me to make adaptations. First, I will think about how I would like my holidays to feel to me, what I would like to do, and who I would like to include. Then, I will review my wellness tools and use them to adapt each part of my WRAP to make this holiday season special and enjoyable. 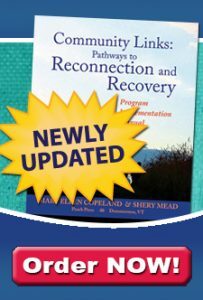 I will pay special attention to the section ‘When Things are Breaking Down.’ As I’ve gotten older, retired, developed some health issues, had family members with difficult issues, and the world seems more and more uncertain, I seem to find myself there more often. My adaptation of that section for the upcoming holidays will be particularly specific. 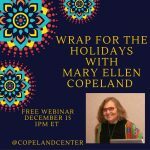 We hope you’ll join this webinar to add tools and resources to your WRAP and to help make your holiday season what you would like it to be. You can register for the event here.